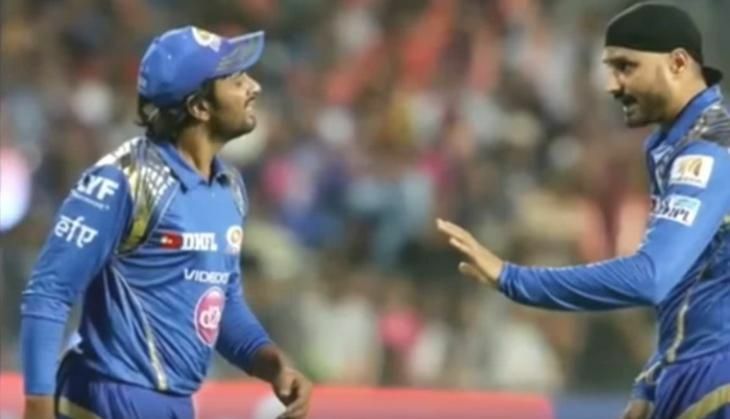 Veteran spinner Harbhajan Singh has sparked controversy by engaging into a heated argument with his Mumbai Indians team-mate Ambati Rayadu during their eight-wicket win against Rising Pune Supergiants at Mumbai Cricket Association Stadium last evening. The incident took place in the 11th over when Rayudu failed to stop a boundary hit by Pune Supergiants' Saurabh Tiwary on Harbhajan's delivery despite a brilliant effort at the boundary rope. Furious with Rayudu's fielding, Harbhajan started abusing his team-mate which sparked the argument between the two players. Rayudu, who seemed to be disappointed with Harbhajan's behaviour, walked towards his senior player to oppose him. But, the off spinner showed maturity and was seen pacifying him before the situation would have turned out of control. It was not the first time when Harbhajan was seen engaging in an on-field spat. He had earlier slapped tainted pacer S. Sreesanth after Mumbai Indians' defeat to Kings XI Punjab in the first edition of the IPL.